Our Micro and 3000 shot TimeMist air freshener refills will last a full 30 days, and contain essential oils to ensure they are the longest-lasting and highest-quality fragrances on the market! Enjoy an inviting fragrance all year with just one case of refills. Keep your home smelling fresh and fight offensive odors in commercial bathrooms or where you need it most with TimeMist odor counteractants. Whether you are at home or in an unknown place, being greeted by good scent is certainly an amazing feeling. Every house has a specific type of smell. It is really hard to get the scent of home as you are used to it. This smell is essentially the smell of cooking something, detergent, blending with different cleaning products. The smell may not be pleasant for everyone. Hence, it is a prerequisite to foster a specific environment which is pleasant for people entering the premise. It is necessary to add a new scent to your home or office in order to remove the bad odors of you surrounding environment. The TimeMist 3000 Shot & Micro Refill is worth mentioning in this regard as it helps in removing the bad smell from your home. 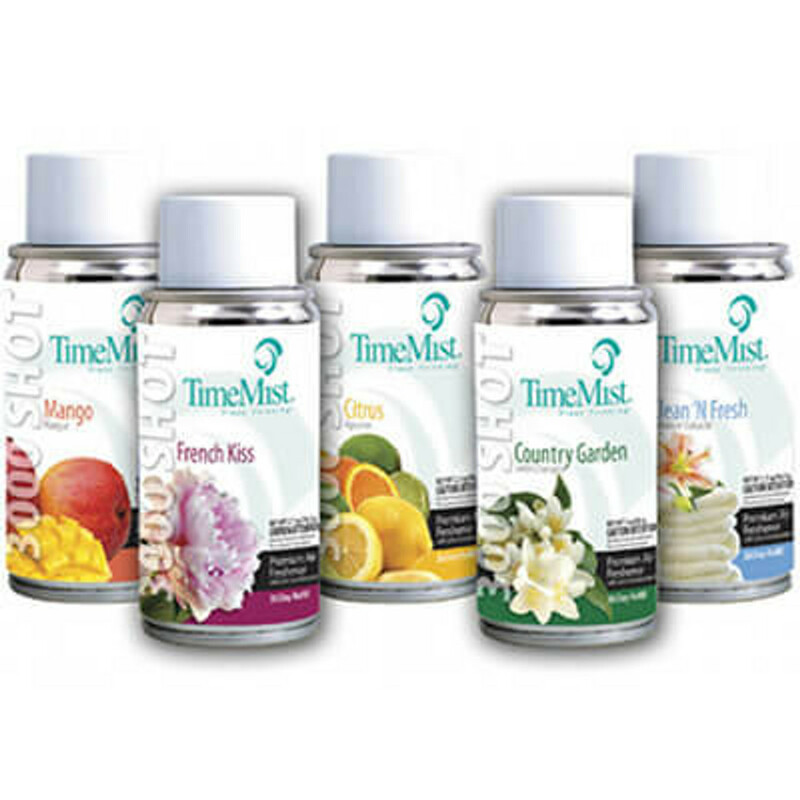 TimeMist 3000 Shot & Micro Refill is recognized to be air freshener refills which comprise of odor counteractants for the elimination of offensive odors. This is considered to be a perfect option for the removal of odor control for different premium fragrances and budget which remove the odors. The fragrance comprises of essential oils for ensuring that your home has a pleasant smell and every person, entering your home will get mesmerized by the smell. The air fresheners are comprised of high-quality fragrances, available in the market. The refills of the air freshener last for the time duration of 30 days. The cool refreshment of the air freshener is known to encompass the senses owing to which it has become the prime choice of people in these days. You are sure to fall in love with your home time and again as you make use of this room freshener for your home. You will be able to make a long-lasting impression on the guests with the use of this room fresher. The primary application of this room freshener is the removal of odor. Hence, you are sure to get benefitted as you use this room freshener at your home. It comes with ultra-concentration for working at a faster rate for a longer duration of time. It can be used for the time duration of 30 days continuously at a regular time interval of 15 days. If you are looking for odor and fragrance counteractants in a single can, this is the perfect product for you. The level 1 aerosol ensures that it is a safe product for the different storage areas. It is considered to be a perfect option for use in TImeMist Micro Remote Dispenser and TimeMist Micro Dispenser. It fits the TimeMist Class, TimeMist Model 1000 and TimeMist Plus metered dispenser perfectly. If you encounter any unpleasant smell at your home, choosing the TimeMist 3000 Shot & Micro Refill is an ideal option to confer a pleasant smell to your home. It is one of the suitable options for making the kitchen and home nicer. In case you want the offensive odors from your home completely, go for the product without a second thought.